Image Size (H x W): 40" x 26"
Medium:Serigraph on Paper in 65 colours. Edition of 100. 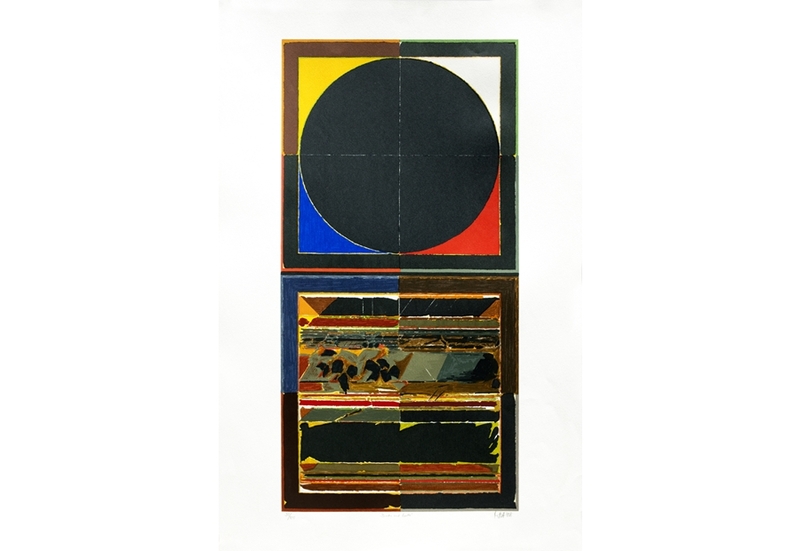 >Born in 1922 in Barbaria, Madhya Pradesh, Raza studied at Nagpur and later at the sir J. J. School of Art in Mumbai. He was a founding member of the Progressive Artists Group in 1948 with M. F. Husain, K. H. Ara, F. N. Souza. In 1950 he won a French Government scholarship to study at the Ecole Nationale Superieure des Beaux Arts in Paris, where he moved permanently soon after. Raza's style has evolved over the years - he began with expressionist landscapes, which became rigid, geometric representations of French towns and villages in the early 1950s, following his move to Paris. In the late 1970s, the artist's focus turned to pure geometrical forms; his images were improvisations on an essential theme: that of the mapping out of a metaphorical space in the mind. The circle or "Bindu" now became more of an icon, sacred in its symbolism, and placed his work in an Indian context. Both converge into a single point and become inseparable - the "Bindu" (the dot or the epicentre). "The Bindu symbolizes the seed, bearing the potential of all life" Apart from numerous solo shows, including a retrospective at the Musee de Manton in Paris in 1991, Raza participated in the Venice Biennale in 1956, the Manton Biennale in 1964 and 1976, the Rabat Biennale in Morocco in 1968 and the Royal Academy in London in 1982 amongst many others. His work is represented in the permanent collections of the National Gallery of Modern Art in New Delhi, the Musee National d’Art Moderne in Paris and the Asia Society in New York. Honours and Awards 2013 Awarded the ’Padma Vibhushan’, by the Government of India. 2007 Awarded the ’Padma Bhushan’, by the Government of India. 2004 Lalit Kala Ratna Puraskar, Lalit Kala Akademi, New Delhi. 1981 Awarded the ’Padma Shri’, by the Goevrnment of India. 1981 Elected Fellow of the Lalit Kala Akademi, New Delhi. 1981 Awarded Kalidas Sanman National Award, Government of Madhya Pradesh. 1956 Awarded the ‘Prix de la Critique’, Paris. 1948 Gold Medal, Bombay Art Society, Mumbai. 1946 Silver Medal, Bombay Art Society, Mumbai. S H Raza passed away on 23 July 2016. .